Democratic elections throughout the Palurin Confederacy (the newly-independent cities of Rigaleus, Sanctuary City and New Dravin). 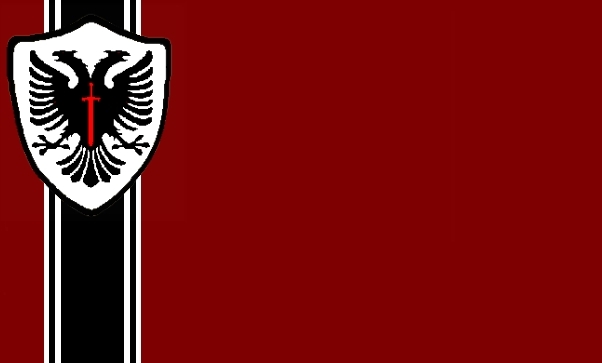 The Sons of Dravin are a fascist party, inspired by the Dravin Uprising. The Sons of Dravin spent most of their existence as the National Guard, a small vigilante paramilitary force that kept order on the streets more effectively than even the Inquisitorial Guard police force run by the Church. Though they were called the National Guard, they were only present in eastern Sirdovia. The National Guard gained much notoriety and respect from the public through their extremely successful campaign against street crime and gang violence. After the failed Dravin Uprising, the National Guard took a more political stance, claiming that to ensure public welfare and safety from similar Church attacks, Church power had to be removed from the east. The National Guard units gained a reputation of valour, tactical innovation and cool professionalism during the street fights against the Church. National Guard became overnight national heroes to the newly independent Palurin Confederacy. After the Blue Revolution, as it has become known, the National Guard set up a dedicated political wing, the Sons of Dravin. With the elections approaching, the Sons campaigned on a platform of isolation from the war, the strengthening of the borders, nationalism and patriotism, harmony between the classes (as opposed to the class war advocated by the Communist Popular Resistance Movement) and the building of infastructure. It was stressed that the Confederacy needed to become a strong force quickly were it to survive the civil war. Strong leadership and a strong military force were required, and could readily be provided by the Sons of Dravin and the National Guard, respectively. The Sons of Dravin quickly gained widespread support, especially from ex-military personnel and the middle class. The Sons merged with several smaller nationalist, militarist and fascist groups, eventually even consuming their long-standing rivals, the nationalist Palurin National Liberation Front. It is worth noting the underwhelming performance of the Popular Resistance Movement. The Movement campaigned for the merging of the Confederacy and the Sirdovian Soviet Federation, and was expected to be a formidible rival of the Sons of Dravin. However, news of the descent of the Red Messiah, the taking of Red Throne and the retreat of the Soviet People's Army brought the future of the Soviet Federation into serious doubt in the minds of the public, just days before the election. Since winning the election, the Sons of Dravin have announced that the National Guard is to become the official armed service of the Palurin Confederacy. The Sons have declared that they will carry through their election promises, and that their first priority is the security of the Confederacy's borders. Due to the Congregation being preoccupied with the Communists to the north, the Confederacy has vowed to defend their borders and - if needed - the world against the Eldar threat. The new government claims that the Eldar, a far greater threat than any revolution or theocracy, has dangerously been left ignored by the other nations of Sirdovia. 15,000 National Guard troops are being deployed across the southeastern border and are building barricades and fortifications to prepare against an undoubtedly imminent Eldar invasion. President Comler has authorised the National Guard to declare martial law in any and all regions of the Confederacy, to ensure that the Guard has every opportunity to maintain order in the event of an Eldar invasion of the nation. The government has advised citizens to prepare for the worst, but hope for the best. The Sons of Dravin are led by President Comler. It has been announced that a corporatist council composed of political, military, business and labour leaders is to be established to act as a parliament. Though highly militarist, the fascists oddly seem to be the group most eager for peace in the war-torn region. Though far from friendly with the Congregation or the Soviet Federation, it is stated that peace and security in the region are of prime importance to the new leaders of the Confederacy. Adineas the Red wrote: Democratic elections throughout the Palurin Confederacy (the newly-independent cities of Rigaleus, Sanctuary City and New Dravin). As soon as this eldar threat is over i will come and unify Sirdovia! Alledon Recognizes the Palurin Confederacy.